Editor's Note: Yes, it is after Christmas, but now is the time to mark it on your calendar to start working on it in 10 months time, if the Lord hasn't come. The great thing about a blog is you can scan the labels for keywords e.g. Christmas, Easter, community, prisons, etc. Click on the word (the tag) of interest to you and all the relevant stories will come up for you to read. 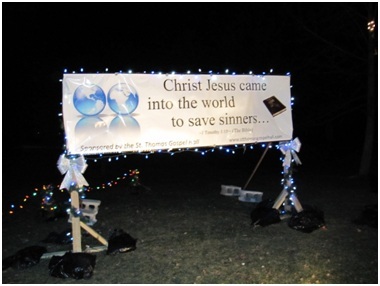 This story below has been submitted on behalf of the St. Thomas Gospel Hall in Ontario. Each year during the month of December the local park is used to showcase light displays of local businesses and organizations called “The Fantasy of Lights”. There is no cost in being a part of it, and it is an opportunity to share the gospel for a month. The only thing that is requested of each group is to volunteer at the front gate where each car is greeted and donations are received to cover the costs of electricity and maintenance. 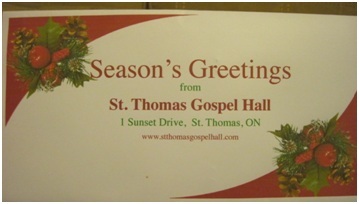 The St. Thomas Gospel Hall was excited to be a part of it this year. Our theme verse was 1Timothy 1:15 and so to portray it we had a globe, a manger and a cross with the shadow of the cross reflected on the globe. 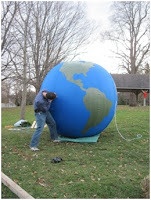 We were able to find an 8 foot beach ball on the internet. 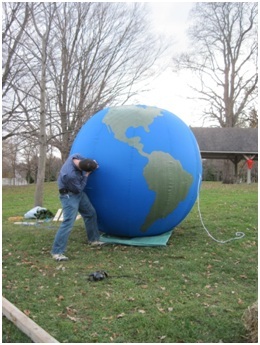 With the talent of several of the believers we came up with a blue vinyl covering, and using a green tarp, cut out the land forms to make the globe. 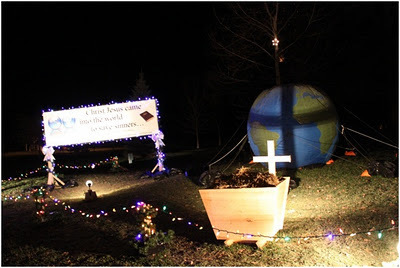 In front of the globe, there was a cross and in front of that, a wooden manger. Screwed to the back of the manger was a spot light that shone on the wooden cross creating a large shadow of a cross on the globe. To the left of the globe was a large banner with the theme verse, two globes portraying all of the landforms and a Bible. Also written on the bottom of the banner was “Sponsored by the St. Thomas Gospel Hall” and our website stthomasgospelhall.com. We decorated the posts holding the banner with garland, lights and bows. We also outlined our assigned plot with a “fence” using garland and coloured lights. It was exciting to see the different talents and gifts at work during the project. We had fun the two nights that we volunteered at the gate and supervised the park. It was an opportunity to get some of the older Sunday school students involved with the volunteering. It was a good feeling to be involved in a community activity and most of all knowing that Christ’s name was being lifted high for a whole month. With the help Jim Elliott of the Broadview assembly in Toronto we were able to make some attractive calendars to give out in the community and specifically to neighbours and areas where Sunday school children are picked up. One of the believers took several pictures of local scenery and landmarks and then we chose two of them (for variety) to be printed and attached to our calendars. 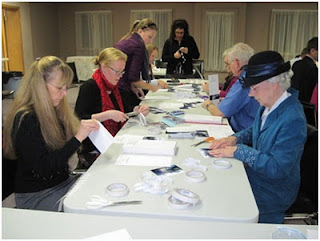 Two Sunday afternoons the believers met for a couple of hours to assemble the calendars and the envelopes. 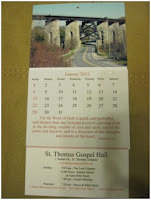 Each calendar had printed on it the name of the hall, the order of meetings, and a gospel verse on each month. In an effort to reach a group of people other than our Sunday school contacts we put together some Christmas baskets. The idea was to provide the believers with a gift for their neighbours, co-workers, community service workers, or anyone else they wanted to reach with the gospel. One sister found a greenhouse that was closing down, so got several baskets at a reduced price, and another sister made regular rounds to the second hand stores to pick up more baskets (the second hand ones were spray painted). 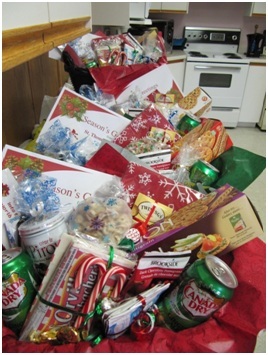 Good quality items were purchased to fill the baskets along with a calendar, Christmas bookmark, Christmas tract, notepad, and a pen with a verse. 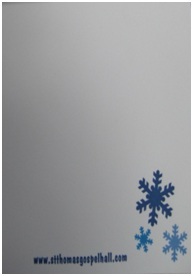 The pads were printed by one of the Christians with a snowflake graphic including our website address. In addition to the purchased items, a yummy white chocolate snack mix was made and bagged in Christmas cellophane bags. Another item included plastic spoons that were dipped in chocolate and crushed candy cane and bagged as well. To make things more attractive little packets of hot chocolate, tea and popcorn were tied with curled ribbon. 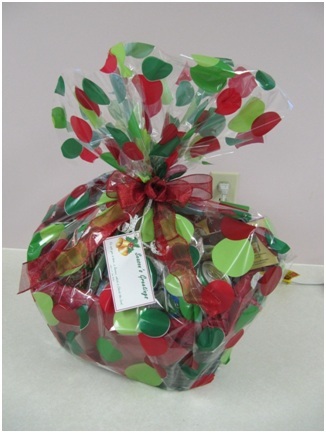 Finally we filled the baskets, and wrapped them in cellophane with a bow and a gift tag. We made around 80 of these baskets. The believers took them according to their needs, and some took up to 10. The feedback was pretty exciting. The shock on the faces of some of the community service workers was priceless as they received their unexpected gift. These baskets opened the door for building relationships with neighbours as well.